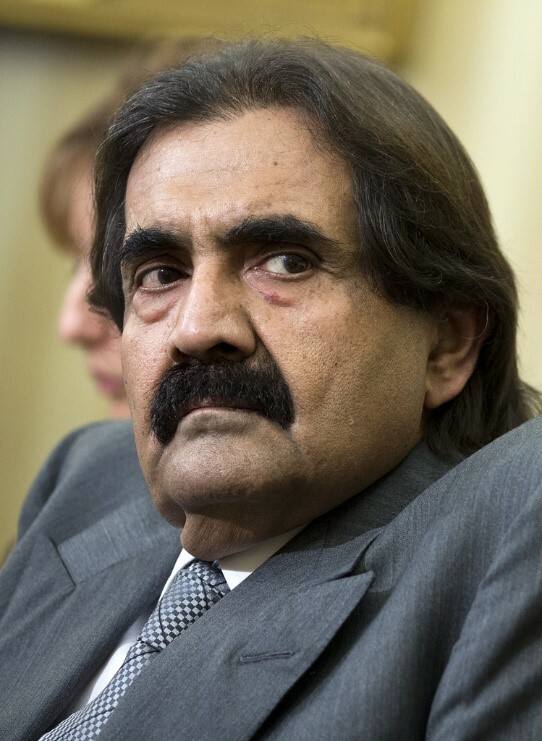 DE-Tenants.org continues to investigate investments made by the former prime minister of Qatar Hamad bin Jassim bin Jaber Al Thani (HBJ) and his cousin the seventh Emir of Qatar Hamad bin Khalifa Al Thani. We last reported that, beginning in June 2014, HBJ and his family used an investment vehicle based in the British Virgin Islands, Paramount Services Holding Limited, to acquire 5.8% of Germany’s biggest bank—Deutsche Bank AG. HBJ’s investment came at a critical time, allowing Deutsche Bank to secure an EUR 8 billion stock offering in 2014. In August 2015, HBJ transferred some of his shares to Supreme Universal Holdings Ltd., a Cayman Islands company owned by the Emir Hamad Bin Khalifa, who acquired 3.05% of Deutsche Bank. Today we add further details. As of July 2016, the Financial Times and the Wall Street Journal reported that Paramount and Supreme (the Al Thani royals’ offshore investment vehicles), combined, held just under 10% of Deutsche Bank's shares, making the Qataris Deutsche Bank’s largest combined shareholder. Then in March 2017, HBJ reportedly participated in another capital call. But it has been revealed that the July 2014 and March 2017 investments by HBJ involved margin loans—meaning that what sounded like a Qatari vote of confidence may have been a hedged bet. In July 2016, the Financial Times and the Wall Street Journal reported that Paramount and Supreme had boosted their combined stake in Deutsche Bank to just under 10%, making the Qataris Deutsche Bank’s largest combined shareholder. However, despite the reported Qatari stake increase, confusion lingers over the matter. No record of the share increase has been located by DE-Tenants.org and Deutsche Bank’s website still reports that Paramount and Supreme each hold 3.05% of the bank. The BaFin website similarly reports that Paramount and Supreme each hold 3.05%, and BaFin shows no changes since 25 August 2015. A prospectus document from 2017 states that as of 10 March 2017, that Paramount and Supreme each held 3.05%. An image excerpted from the prospectus is below. Reuters may have explained the discrepancy when it reported that the Qataris “increased their stake to just under 10 percent, including options, in July this year ” (emphasis added). Reuters also estimated that, at the time of writing in October 2016, the Qataris may have lost, on paper, over $1.2 billion on their investments in Deutsche Bank because the stock had been trading so poorly. Recall that HBJ purchased his initial 5.8% stake in June 2014 for EUR 29.20 per share. In the first half of October 2017, Deutsche traded at over EUR 14, well below the June 2014 price. In March 2017, Deutsche announced plans for its fourth capital hike since 2010. Deutsche launched (yet another) EUR 8 billion rights issue of 687.5 million new shares, priced at EUR 11.65—a steep 32% discount below the EUR 17.08 where Deutsche’s stock closed the day before the announcement, on March 2. The capital raising was closed on April 6. News accounts report that HBJ took part (note: German language source) in this fourth capital hike in March 2017, after he and Hamad bin Khalifa had already attained a combined stake of nearly 10% in Deutsche Bank the previous summer. Reporting is unclear how HBJ’s stake changed after the March 2017 capital hike, but his new position did not drive the Qataris’ stake over 10% according to multiple subsequent reports. However the March 2017 capital hike changed HBJ’s stake, HBJ’s participation in the fourth capital hike was revealed to involve a margin loan. Bloomberg reports that HBJ is using a margin loan of about $1 billion to fund his participation in the March 2017 offer. The margin loan, issued by Bank of America, is backed by Deutsche shares as collateral. HBJ’s initial Deutsche investment of EUR 1.75 billion back in June 2014 was also alleged, according to a Bloomberg article, to involve a margin loan issued by Qatar National Bank, which is linked to the Al Thani family and the Qatar Investment Authority. Qatar National Bank reportedly offered HBJ loans to fund the purchase as well as derivatives to protect him from losses on the shares he purchased. HBJ’s two margin loans would not be the first time Qatari royalty have made confidence-boosting capital infusions in banks only for the truth later to be revealed that the Qataris’ investments were in fact money backed by bank loans. During the financial collapse of 2008, the Emir’s brother Mohammed Bin Khalifa invested in Iceland’s largest bank, Kaupthing. The royal’s investment was announced with “fanfare,” but he was really using Kaupthing’s own money—a form of market manipulation. Also during the collapse, the Qatar Investment Authority and its then-CEO HBJ in his personal capacity both invested in Barclays Bank of Britain. The same problem ensued: the investments allegedly may have been made with Barclay’s own money—a form of market manipulation. The Kaupthing case resulted in jail sentences (though not for Mohammed Bin Khalifa) and the Barclays case resulted in indictments and an ongoing criminal case. DE-Tenants.org will be reporting on the Barclays affair in an upcoming seven-part post. The marginal loans allegedly used to purchase Deutsche Bank shares are similar in that, ultimately, HBJ used other people’s money and protected himself against loses with undisclosed derivatives. This maneuver, like what happened with Kaupthing and Barclays, runs the same risk of inaccurately portraying to other investors a Qatari vote of confidence—even though HBJ was hedging his Deutsche investments. Our next post reviews reporting on European authorities looking at Qatari investments into Deutsche Bank.